While they don't look too different compared to last year's S6 and S6 edge, Samsung's Galaxy S7 and Galaxy S7 edge come with important features that their predecessors do not have, one of them being dust- and water-resistance. Both the Galaxy S7 and S7 edge are IP68-certified. According to Samsung, this means they can survive up to 30 minutes in up to 5 feet (1.5 meters) of water. However, it looks like the handsets can remain safe and sound underwater for much longer than that. 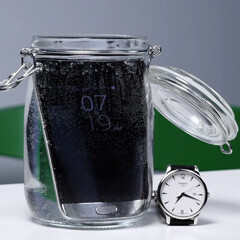 Unbox Therapy recently made an experiment with a Samsung Galaxy S7 edge, dumping it (powered on) inside a jar full of water for no less than 16 hours and 36 minutes. The device survived, seemingly working just as before being left underwater. Of course, it's worth mentioning that the water inside the jar exerts little pressure on the phone. We don't know what could happen if you leave a Galaxy S7 at, say, 1 meter underwater for so many hours (pressure obviously increases with depth). But we don't advise you to try that, and, honestly, neither the jar experiment. Hopefully, if you own a Galaxy S7 or S7 edge, you won't have to deal with extreme cases like the one we're presenting here, even if the smartphones may be able to survive underwater longer than the time advertised by Samsung. Pretty cool. Remember, this is just showing how long it can survive. it isn't recommended to swim around with your phone. This waterproofing is for if you accidentally drop your phone in a liquid. people seems to not understand this. If that's the case, the iPhone 6s/6s plus are waterproof. My point is who is going to be in water for 16 hours. The iPhone 6s/plus can be in the water for over an hour and still work. It's all over YouTube. If that's the case it's wterproof with or without the certification, because who is going to have their phone in the water for over an hour? Ip certification is over kill to the third power!! I'm going to go so far as to say the iPhone is certified on some level, but they never bothered to certify it. You know certain food would be taking it to the bottom of the ocean with a submarine so it would fail and then we would have watergate. Stop fooling yourself. A glass of water spilled on my 6s plus and now my earpiece is not working anymore. Well why don't you try it with your iPhone and video it so we all can see since you are so sure it is water proof. April Fool's Day was on April 1st, you're about 3 days late with that comment. Ahaha I thought Jedi masters weren't supposed to be so salty, especially one as ancient as you. "Forgot to drink my prune juice this morning, I did." Unsurprisingly, not a single complaint from you when other iSheeps bring up apple in a non-apple-related...so long as it's praising, it's fine with you. So now Apple came out of no where in this article and side worshipper claiming it to be water proof?? Butthurt?? I used to swim with my S5, taking underwater pictures for me and my family, and I never had any problems with it, sold it in a brand new condition. Just don't put it in front of the shower head or sink faucet with the spray option. Remember, this great phone is not waterproof for submerging, not against jet streams of current and can potentially damage your $1500 phone. If you'd like my friends email (with her permission) you are more than welcome to ask her why her S7 is refusing to turn on :) Just looking out for other users who bring their phone into their showers. The truth is that you're just butthurt. I'll do you a favor by saying "iPhones are more water proof than galaxy s7"
Because it's not about the duration, but about the water pressure. That's why IP certificates say about depth the phone can be submerged. The real question is...........how many hours can it last under that Lil Wayne champagne?? Even though my S5 is IP certified I would never take the risk of dunking it in water because those seals just looked to fragile, but the S7 is a solid lump and I've already dunked it in the fish tank. Up next, Galaxy S7 versus David Blainẹ. I just found out David Blainẹ is a banned word?? PA you are so early..
Xperia Z2 survived 2 weeks. Lol. Only 16 hours? lol its people like you who will never be satisfied with your phone.